Cat asthma can be a serious condition. In case a cat does come down with asthma, it's important to know the causes of asthma and potential irritants that could trigger an attack. Here is some information about cat asthma. Coughing and wheezing, sometimes persistent. Gagging up a foamy mucus. Squatting with neck extended and shoulders hunched. Symptoms of cat asthma can be triggered by exposure to things like pollen, dust, perfume, grass, cigarette smoke, flea solutions, chemical vapors, deodorizors, hair sprays, deodorizers, carpet fresheners, air fresheners, and more. Though there are a number of factors that could potentially contribute to the development of asthma, it's thought to be the result of allergic bronchitis. This typically comes to the surface when an inhaled allergen or substance causes the cat's lungs to inflame. Because allergies and asthma are so closely related, it's important to keep allergens like pollutants and pollen away from the cat. Symptoms similar to asthma can also be associated with heartworms, respiratory parasites, obesity, and stress. 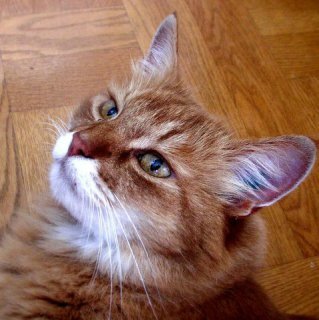 Any cat suffering from asthma should receive immediate veterinary attention. Once you take your cat to the vet, they'll perform physical examinations and may need to perform diagnostic tests. If the cat is experiencing an attack at the time, the cat may need oxygen therapy as well as a bronchodilator. Once the cat is diagnosed with asthma, there are several asthma medications for cats available that the vet can prescribe to ease symptoms. 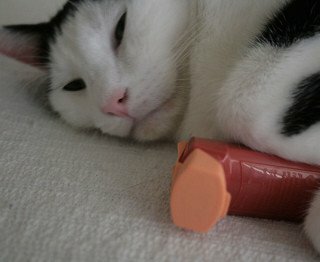 Be careful with a cat that has asthma, and be sure not to do anything which could cause stress. Stress can worsen asthma attacks and is best to be avoided.